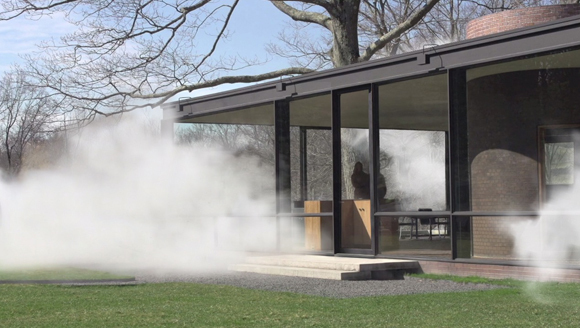 Coinciding with the 65th anniversary of the Glass House and its 2014 tour season, the Glass House will present Fujiko Nakaya: Veil, the first site-specific artist project to engage the iconic Glass House itself, designed by Philip Johnson and completed in 1949. Nakaya, a Japanese artist who has produced fog sculptures and environments internationally, will wrap the Glass House in a veil of dense mist that comes and goes. For approximately ten minutes each hour, the Glass House will appear to vanish, only to return as the fog dissipates. Inside the structure, the sense of being outdoors will be temporarily suspended during the misty spells. The Glass House, situated on a promontory overlooking a valley, is subject to changing wind patterns, as well as variable temperature and humidity, that will continually influence the interchange between Veil and the building it shrouds. Fresh water, pumped at high pressure through 600 nozzles, will produce an immersive environment that reveals these dynamic conditions. According to Nakaya, “Fog responds constantly to its own surroundings, revealing and concealing the features of the environment. Fog makes visible things become invisible and invisible things—like wind—become visible.” The drama of Nakaya’s work rests in the continuous interplay between what is visible and what is not. Known coordinates vanish, only to be replaced by a miasma, rich in changing phenomenological effects, that evoke a sense of mystery, foreboding, and wonder. This installation is part of a greater initiative to transform the Glass House campus into a center for contemporary art and ideas, in particular those that foster new interpretations of the historic site’s meanings. The exhibition will be accompanied by public programs at the Glass House and in New York City, soon to be announced. Nakaya has created fog installations around the world, including projects for the Guggenheim Museum, Bilbao; the Grand Palais, Paris; the Australian National Gallery, Canberra; and the Exploratorium, San Francisco, among others. She consulted with architects Diller Scofidio + Renfro on the Blur Building for the 2002 Swiss Expo, and has worked with numerous artists (including Trisha Brown, David Tudor, and Bill Viola) on environments for music and performance. This will be her first large-scale installation on the east coast of the United States and the first time her work has been presented at an internationally renowned historic site. Organized by Henry Urbach, Director and Chief Curator, and Irene Shum Allen, Curator and Collections Manager, Fujiko Nakaya: Veil is generously supported by the National Endowment for the Arts, the Robert Rauschenberg Foundation, The Japan Foundation, and Oldcastle BuildingEnvelope®. Additional support is provided by Mee Industries, Inc. The Glass House, built between 1949 and 1995 by architect Philip Johnson, is a National Trust Historic Site located in New Canaan, CT. The pastoral 49-acre landscape comprises fourteen structures, including the Glass House (1949), and features a permanent collection of 20th-century painting and sculpture, along with temporary exhibitions. The tour season runs from May to November and advance reservations are required. For more information, please visit www.theglasshouse.org. The National Trust for Historic Preservation is a privately funded nonprofit organization that works to save America’s historic places to enrich our future, re-imagining historic sites for the 21st century. The guiding principle of this initiative is that historic sites must be dynamic, relevant, and evolving in order to foster an understanding of history and culture that is critical, sensory, and layered. For general information, please call T +1 203 594 9884 or visit the Glass House online.